We caught up with nutrition expert and Registered Dietitian, Jo-Ann Heslin, MA, CDN, RD who has sold over 7 million books on nutrition to hear her take on feeding challenges and raising a healthy family. Every parent has dealt with difficult dinner behaviors, food jags and mealtime standoffs. Gaining control over when they eat and what they eat is part of the natural separation process in a child’s desire for independence. Children learn by example; make healthy eating a family affairChildren learn by observing the world around them and being mimics. Parents are their first teachers. If parents want children to eat healthy and select good choices, they need to be good role models and stock the house with healthy selections. Kids aren’t going to eat their veggies if Dad passes the green beans and doesn’t take any. Children won’t snack on grapes when Mom is eating chips. 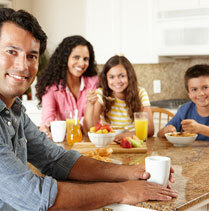 Make healthy eating a family affair. Encourage but don’t force your child to try new foods.There are some very valid reasons why kids resist new foods. Children’s taste buds are more sensitive than adult’s. What adults experience as a blend of flavors may be an unpleasant combination for young children. This is a reason why some kids like foods separated and enjoy plain foods, like “naked spaghetti” rather than a sauced version. A subsection of all humans have more sensitive bitter taste receptors. In these children this will result in a dislike for foods like watercress, broccoli, bok choy, kale, kohlrabi, and turnip. In contrast all kids love sweet tastes. Again, this is based on the fact that young children have a higher bliss point for sweetness. Where adults would find a taste overly sweet, children will readily eat the food and not find it unpleasant.Neophobia, fear of something new is a definite factor that limits the types of foods a child will eat. As children grow and mature, new things become challenging rather than fearsome and all experiences, including food choices, broaden. Generally the more a child is exposed to a particular food, even if he doesn’t eat it, the more neutral his feelings about the food become. Children begin to become more adventurous and willing to try new foods around the ages of 7 to 9. Teach your child to eat a colorful plate.This automatically offers a selection of foods with a selection of different nutrients. Encourage them to eat at least 3 different foods at a meal, each of a different color. Some of the combinations may be odd but the foundation of good eating is variety, so if your child wants dry Cheerios, celery sticks, peanut butter and orange juice for lunch, you have achieved a healthy meal. Older kids may enjoy this approach as well with small amounts of many options packed for lunch. What do you advise parents to do with an anti-fruit/vegetable kid? 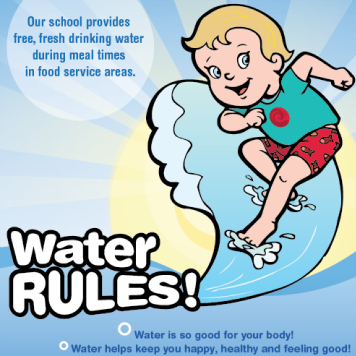 As children grow and become exposed to different foods, their preferences will change and evolve as well. In the meantime, don’t worry too much. When one food is rejected chances are there is another nutritious food that can be offered instead. Fruits can supply just as much vitamin A and C as vegetables. If your child won’t eat spinach or broccoli, he can be just as well nourished with papaya and watermelon. Try being creative to make eating more fun. If your child rejects cooked vegetables serve raw instead. Offer vegetables with a low fat dip, hummus or even a warm cheese sauce for dunking. Fruits can be served with peanut butter, ricotta cheese, or even drizzled with a small amount of chocolate syrup as a dessert plate. Or use fruits as a meal side instead of vegetables. Applesauce, grilled peaches, lightly stewed strawberries or wedges of melon all make great additions and can be enjoyed by the entire family. You are not only providing options but you are expanding everyone’s eating experience. Did your children have any fear of specific foods or food struggles? My first daughter was a very finicky eater, but my second daughter would have eaten a tablecloth! I’ve found that children have control of three things, going pee in their pants, if they go to bed on time, and what they eat. I’ve learned that all children are universal; I had to apply strategies that I was giving others like choosing raw veggies if they didn’t like them cooked. We had “universal substitutes” that didn’t require extra cooking. If the girls didn’t want the protein we were serving like chicken for dinner I allowed them to choose peanut butter instead. I did bizarre things like putting a bowl of popcorn on the table instead of potatoes! Some days I would offer all fruits instead of vegetables. I was always throwing them for a loop, trying to give them the idea that all foods are good foods. Growing up, my mom always made my sister and I leave the house with breakfast. We would challenge her by asking for crazy things for breakfast, and she always gave us what we wanted! Her rule was that we had to leave the house with food in our stomachs. It was a great lesson for me. We soon stopped running her in circles and let her feed us! Growing up in a non-traditional house has taught me a lot. It has brought back the fun of eating. 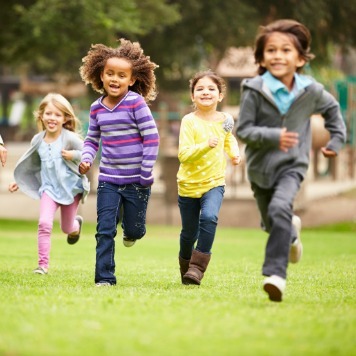 We’re always focused on health, you have to give in to a degree, give children some of the things they’re looking for. Now that your children are out of their teenage years, have their healthy eating habits continued? My girls are now exceptionally good eaters! Exposure has allowed them to be more adventurous, now they eat things they always said were off limits. The lessons I always taught were learned! With healthy eating, parents are making deposits in a bank, but they won’t always see the withdrawals immediately. What is your favorite child-like kid snack with fruits and vegetables? I have always told my girls two things: Go out and play and eat an apple. One consistent snack: fruit! We had fresh fruit and dried fruit around at all times, and I always tried to incorporate fruit into food. Because we live on the East Coast and winters are so cold, I had the girls eat fruit in the morning, heating apples and pears with a teaspoon of brown sugar and we called it apple or pear pie! I would have to say I depended on fruit more than anything. Another thing to remember, negotiating is key! 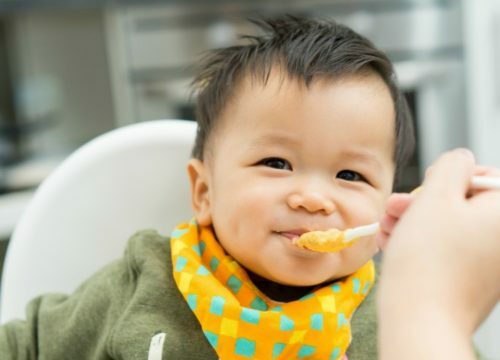 How can parents be more conscious about feeding the right portion to their children? This is a great opportunity for teaching and modeling. If parents split a main dish portion when eating out, or order a small hamburger you are modeling to your children the correct amount to eat. How many times have we thought to ourselves, “Wow, that bagel is enormous.” Voice that concern to your child and tell them that size is much too large for one person, “Want to split with me?” Order small – smaller portions = a smaller you and is a simple consistent step we can all take to manage weight over the long term. Parents are the gatekeepers of their children’s diets. It is our job to offer our children the right amount of food. Go with smaller portions whenever possible. Children can always ask for more, but when presented with a large amount of food, it could tempt them to overeat and override the natural feeling of fullness. Never insist a child clean their plate. They should be taught to eat until their belly feels full and respect them to make that decision. I personally like individually wrapped portions and 100-calories packs. They are convenient and teach us what makes up a reasonable portion. Snack size and miniature candy bars, pudding cups, Dixie cups, and small bags of chips all provide a treat in a reasonable portion size. What is your best secret for managing your weight? Besides eating well I’m very committed to activity. I try to get 150 minutes of exercise a week as a combination of swimming, dance aerobics and yoga. In addition, I frequently wear a pedometer to see if I get close to 10,000 steps a day. I’m a big fan of what I call ‘everyday fitness’ – putting activity into your day as often as possible – climbing stairs, walking to an appointment instead of taking a bus or subway, gardening, even washing windows. I’d rather move than sit and will often do yoga stretches, walk on a treadmill, or lift free weights when I watch TV. Activity has become such a natural part of my day, I rarely think about incorporating it any longer. And, it has worked because my adult weight has been stable for over 30 years. When you have grandkids, what do you think your approach to healthy eating will be with them? I hope that I’d do the same thing that I did with my own children, be a good role model! I used food like a learning laboratory. I taught without preaching. I would put the girl’s highchairs at the kitchen counter and they were the cooks. My husband cooked once a week and I would leave whole wheat Italian bread, pizza sauce, cheese…etc so they could make a pizza. The girls helped prepare dinner and it didn’t always turn out perfectly, but it taught them that eating is fun, a recurring pleasure in life! Jo-Ann Heslin, MA, CDN, RD is author of the nutrition counter series for Pocket Books including The Healthy Wholefoods Counter, The Cholesterol Counter, 7th ed., The Diabetes Carboydrate and Calorie Counter, 3rd ed., and The Complete Food Counter, 2nd ed. She has been a consultant and nutrition educator for more than 30 years and hosts the website www.TheNutritionExperts.com.